The Brian Lehrer Show – Feat. Ruben Diaz Jr. Listen to Ruben Diaz Jr. on the Brian Leher Show, the BP mentioned that the community had an opportunity to provide input on the FD plan on at least two occasions. The first was the IDA hearing after the announcement was made two days later in Manhattan. The other, he claims was made by EDC to the Community Board which is FALSE!!!! The community board was not consulted. ¡Díle “NO” a Fresh Direct! La compañía FreshDirect ha propuesto mudarse al Sur del Bronx desde su ubicación actual en Queens. ¿Qué significará este mudanza para nosotros, los residentes del Sur del Bronx? Cientos de camiones más pasando por nuestro barrio que ya sufre de las tasas de asma más altas del país. Promesas de empleos, pero ninguna garantía. FreshDirect no se comprete a ningún salario digno para sus empleados. Con major planeamiento, los $120 millones en subsidios ofrecidos pueden crear más y mejores trabajos. La alcaldía y presidente del condado del Bronx han ofrecido a FreshDirect más de $120 millones en subsidios provenientes de nuestras contribuciones de impuestos. ¿Por qué darle a una corporación nuestro dinero mientras se están cerrando nuestras escuelas? Hay mejores opciones: ¡Trabajemos juntos para un mejor acceso a la costa! El propósito de FreshDirect es construir una fábrica enorme en Harlem River Rail Yards en la costa del Sur del South Bronx, ubicado al sur de la calle 132. En realidad, esta propiedad es pública y pertenece al Departmento del Transporte del Estado de Nueva York. ¡Un desarollo de uso mixto con vivienda asequible, espacios comerciales, educacionales, y recreacionales con acceso al río sería mejor para todos! ¿Como se puede decirle “NO” a Fresh Direct en el Sur del Bronx? ¡Díle a todo el mundo! In the last week we’ve made quite the splash! We will continue to Unite as a community to let our voices be heard. Crain’s: Did FreshDirect deserve more than $100M in tax breaks and subsidies? 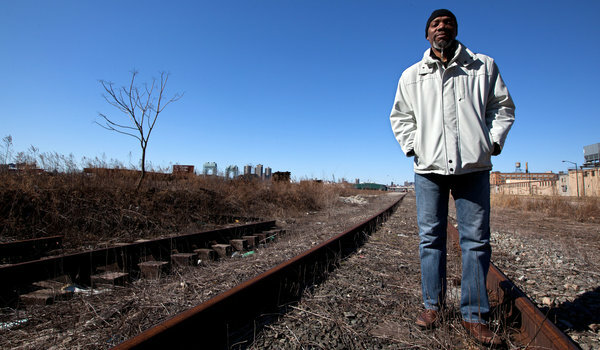 Here, between the peeling steel girders of the Willis Avenue and Robert F. Kennedy Bridges, Mychal Johnson, a lithe, goateed and good-humored Mott Haven resident and community board member, sweeps his arms at grass rising waist-high out of rail pilings, and at the massive green wall of a waste plant. Soon, FreshDirect, the deliver-groceries-to-your-apartment company, is to build a sprawling, taxpayer-subsidized plant here, with 130 delivery trucks rumbling about day and night. In the early 1990s, Gov. Mario M. Cuomo gave the Galesi Company a sweetheart of a 99-year lease to control these 104 acres, the Harlem River Yards. The governor promised a world-class train yard that would create 5,000 jobs and give the city cleaner air. None of that happened. Galesi, however, found a land of promise. The company had leased the acreage at one-third the going rate. And public agencies poured in tens of millions of dollars in subsidies to place rent-paying companies on Galesi’s land. Now FreshDirect steps into this gilded breach, holding a $127.8 million fistful of cash and tax breaks. City and state officials often describe FreshDirect, which will lease its land from Galesi, as “iconic.” Certainly its owners tug at public subsidy programs with the assurance of a farmer sitting before a swollen dairy cow. Not long ago, FreshDirect got a $2 million subsidy to build in Queens. Then the company batted its eyes at New Jersey, and officials there dangled a $100 million subsidy package. This seemed more a feint than a threat, as FreshDirect would have been on the wrong side of the clogged Hudson River tunnels from its customer base. But New York officials tumbled over themselves getting to the bargaining table. Before we go further, let me make an admission. I’ve called FreshDirect, particularly when our boys were young and schlepping them to the supermarket promised a cacophonous experiment in emotional meltdown. I don’t doubt there is a market for bringing groceries to the harried. City officials faced a difficult choice. Mayor Michael R. Bloomberg has tried to steel himself against the siren song of corporate welfare. He risked second guessing, should FreshDirect, with about 2,000 working-class jobs, depart. As for the Bronx borough president, Ruben Diaz Jr., this deal made a small-town booster of him. He signed an unenforceable memorandum in which FreshDirect talks of, maybe, reserving 300 jobs for Bronx residents. His staff members tossed up a Facebook site: “Bronxites for FreshDirect.” Alas, those who are posting appear mostly to be opposed, perhaps because FreshDirect refuses to deliver in much of the Bronx. That’s the wrong question. The company has promised to create 1,000 jobs over the next 10 years. And the city can exact no penalty for failure. Should FreshDirect fall short, it faces no requirement to repay the subsidies. Jason Ackerman made his bones at a now-defunct investment house before founding FreshDirect. He is very 21st century, talking of locavores and freshness and supporting farmers. His warehouses tend more toward the early 20th century. If you haul 50-pound boxes in the 38 degree chill of the warehouse, you can make $8.75 an hour; ride the trucks, and haul boxes down sidewalks and up stairs, and you get $8, along with whatever tips are tossed your way. Local 805 of the Teamsters made unsuccessful runs at organizing the warehouse workers. In the last effort, just before the certifying election, Immigration and Customs Enforcement announced a surprise audit of FreshDirect. The company checked its files for Social Security cards and — surprise! — found many workers without documents. Between 100 and 300 left. The company insisted it had nothing to do with the audit. There are those, not the least South Bronx residents, who wonder if America’s densest city should so richly encourage a business that pays little and logs tens of thousands of pollution-belching hours to make deliveries. They could use parkland instead. City officials wave off such objections as beside the point. As for Mr. Ackerman, he is buoyant. He wrote the cover letter to accompany his application for the subsidies. How grand. Imagine if his company paid for that pleasure. Media event with News 12 Bronx at the site where Fresh Direct is proposed to take over more of the waterfront backed by $130 million in taxpayer funds. With local residents interviewed in English and Spanish. Also attempts by security to harass and intimidate and interfere with the reporters.